Many people go through life carrying the weight of the past on their shoulders. In fact, it is likely that everyone has experienced a traumatic event that has caused physical and/or emotional damage and distress. These events linger through ones life and may cause feelings of sadness, anger, anxiousness, and a whole array of other emotions. Even though these events may have happened years ago they still effect ones daily life in ways that may not be known or realized. Whether the distressing event is small, such as tripping on the sidewalk in front of a crowd of people, or large, like being physically abused by a parent, it can negatively effect you far after the event has taken place. Traumatic events like these become frozen in the body causing us to disassociate ourselves with the trauma when it, or one similar to it, presents itself again. The person who trips on a sidewalk may now become nervous around crowds. The person who was abused by a parent may have trust issues and repel intimate relationships. The only way to rid ourselves of these intense feelings is to move the trauma through the body, or in other words “unfreeze” the trauma. One way to do this is through the use of an innovative therapeutic treatment called Brainspotting (BSP). This technique, which is branched from EMDR and Somatic Experiencing, connects with the body’s response to physical and emotional stresses of the past to treat traumatic experiences effectively. BSP is an effective way for clients to directly access the source of their pain and resolve traumas and other mental health issues. With the help of a BSP therapist, a client can identify “brainspots,” more commonly known as fixed eye positions that access areas of the brain where frozen and often inaccessible and unconscious memories are stored and gently process body sensations, thoughts, and feelings associated with the memory. By using focused mindfulness and the expertise of the practitioner who attunes to the energy field and tracks the client’s body movements and facial expressions aides in the finding and healing of this stress. BSP practitioners use this “brainspot” to access the client’s painful emotions, traumatic memories and even treat the physical effects trauma may cause. BSP reaches beyond the scope of talk therapy. BSP practitioners have extensive training in both addressing trauma through BSP and also use BSP to identify and strengthen positive emotions and beliefs that allow new insights to emerge, which enables past experiences to be viewed from a fresh perspective. When discussing how to deal with trauma, They recognize the difficulty of dealing with our emotions. “As a society, we are not trained to sit with uncomfortable feelings and thoughts. We do everything to distract ourselves from being present,” she says. However, as a BSP practitioner, they help clients feel safe enough to face their discomfort. In fact, she shared with me that because BSP calms the part of the brain where painful memories are stored, clients find that they can gently access memories without strong emotions and the fear of reliving them. When I went through a short session, their ability to calm the mind and easily bring up such deep body sensations and emotions assisted me in dealing with my own personal difficulties. As a person who has failed academically in the past, the pressure to succeed as a college student seems overwhelming at times and causes seemingly insurmountable stress. I was feeling burdened by having too much on my plate and not enough time to get it all done. Brainspotting relieved some of the worry, the stress, and the fear of past failures. I could relax a bit more and still accomplish my tasks. 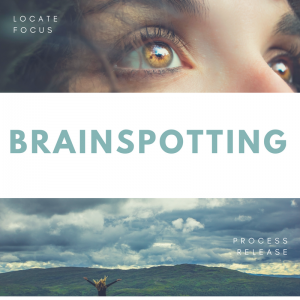 If you struggle with past traumas or distresses, large or small (or even current upsetting incidents you cannot let go of), Brainspotting may be an effective therapeutic remedy for you. Work through distressing events and move beyond your past. Do not continue to be overwhelmed by anger, anxiety, or sadness, but instead provide yourself with the best avenue to alleviate these distressing emotions.